Oh deer, how cute and giant is this deer head? I've been wanting the Deer Head die from FSJ for a while and finally ordered it. It arrived today and I couldn't wait to create with it. 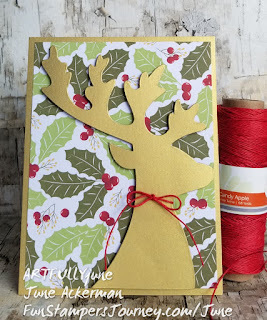 This card came together quickly with brushed gold cardstock and Cozy Prints patterned paper. I finished it off with a bit of Candy Apple Twine tied around his neck. I love how quickly this card came together and how elegant it is. 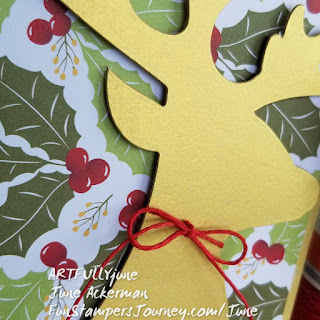 Have you started making your holiday cards yet?